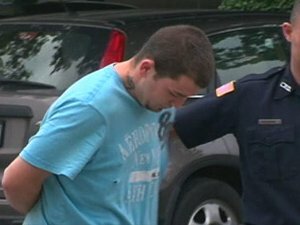 Daniel Burns, 26, was arraigned in Lowell District Court yesterday morning on several Massachusetts Crimes of Violence Charges in connection with allegedly attacking Brenda Finch Wednesday morning at her home. Burns was charged with Attempted Murder, Armed Assault with Intent to Commit Murder, Assault & Battery with a Dangerous Weapon, and Breaking & Entering in the Daytime to Commit a Felony. According to the Lowell Police Department, Daniel Burns allegedly broke into the Lowell home Brenda Finch after she returned from taking her 4 year old child to preschool. She described to police that she noticed one of the windows in her home was up and then began searching the home. When she came upstairs, she reported that a man snuck up on her from behind. Lowell Police allege that Daniel Burns, the man allegedly inside the home, then his Brenda Finch with a pipe and tried to strangle her before leaving. Daniel Burns was arrested at his home in Lowell, though there is no report as to how Burns was linked to the crime. This means that there must be proof, beyond a reasonable doubt, that the defendant actually intended to cause the death of the person. Massachusetts criminal law defines “intent” as involving concentration or focusing the mind for some period of time with determination to commit the act and cause the death of the person. Conversely, an intent merely to disable or scare off, for example, is not sufficient to sustain the conviction of someone for the crime of Assault with Intent to Murder or Kill; nor is it enough merely to intend to inflict serious bodily injury. Following his arraignment on yesterday in Lowell District Court, Daniel Burns was held without bail pending a Dangerousness Hearing. Boston Criminal Lawyer Lefteris K. Travayiakis is available 24/7 for consultation on all Massachusetts Crimes of Violence, including Attempted Murder, Assault with Intent to Murder, and all Massachusetts Theft Crimes. Click Here to Contact a Boston Criminal Lawyer and to schedule a Free Consultation or call 617-325-9500.